PWS is a detent switch potentiometer. There is a centere detent switch potentiometer. 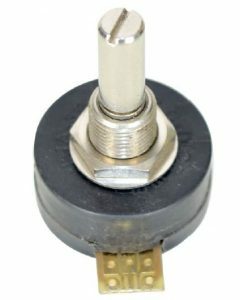 Potentiometer with detent (PWS-25) is a conductive plastic potentiometer with center on off switch. PWS-25 is available in two standard ohmic values 5k ohms and 10k ohms with a center tac-tile switch makes it a compact solution for several applications. 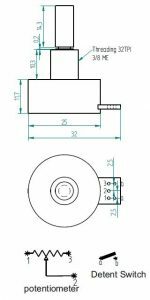 PWS-25 is a conductive plastic potentiometer and hence has a extremely long life. PWS-25 is available with a single turn or endless without stop version. Variable microcontroller based power supplies. For best performance of PWS-25 below points needs to be taken into consideration. 2) PWS-25 should be mounted with Star washer given along with the product and perpendicularity between the panel and axis of Sensor should be maintained.